If you are looking for a smart way to store and organise your clothing items, custom-made bespoke fitted wardrobes, completely tailored to your space and needs is the ideal choice. The word bespoke means “made to order” or customised. Having a closet designed specifically for you means getting exactly what you desire in a fitted wardrobe. Bespoke fitted wardrobe systems such as this offer marvellous benefits. For starters, once they are installed, they look and feel luxurious in appearance. Because the built-in wardrobe design would be customised, you would have the opportunity to choose from a variety of wood textures and other materials. As an example, if you wanted something that looked rich and elegant, Mahogany, Oak and Walnut are simply gorgeous. On the other hand, if you prefer a more casual design, then you might consider Fleetwood, Maple or even Pine. Then to complete the aesthetics, you would need the right accessories and even consider a mirror wardrobe door for added convenience. Another benefit of bespoke fitted wardrobes is that manufacturers can offer ideas for fittings regardless of space. Often, storage systems are used because the bedroom, living room, attic or home office does not provide adequate space for a traditional free-standing closet. For instance, a bedroom in a pitched roof attic, which featured slanting ceilings on both sides of the room would make it impossible to go out and buy just any standard wardrobe. 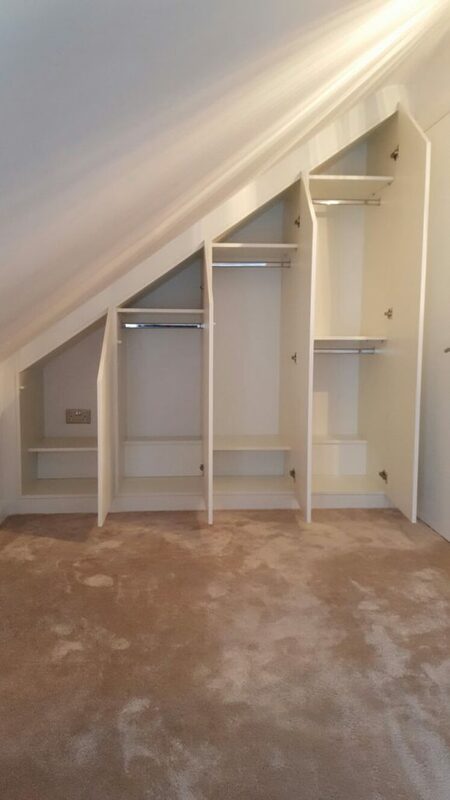 Instead, a made-to-measure, customised fitted wardrobe is the perfect solution to this awkward space. With hundreds of ironmongery and accessory choices, as well as a large selection of finishes, there is an infinite number of possibilities. With systems such as this, you would have a choice of sliding or hinged doors. Naturally, the size and shape of the space would dictate which option suits best. A great tip: In a situation of limited space, sliding doors that slide on a track would be the best option whereas the hinged door option is better for more open spaces – together with providing a more authentic look. For bespoke fitted wardrobes that can be designed with limitless different features, inquire with Capital Bedrooms and Kitchens. All our fitted furniture is custom built for your needs so take advantage of our countless choices of doors, handles, and finishes we have in stock. Our designers are specifically trained to produce the most stunning fitted wardrobes, tailored to your needs. We specialise in very high quality, German standard boards, glass finishes and accessories with over 200 colours and textures to choose – all located our Wembley, London based showroom. Whatever your requirements whether it be adjustable/fixed shelving, shoe racks, tie racks, soft closing hinges, doors and more, we have it all to give you the most beautiful and functional fitted bedroom we to offer.